Transcribed by ZheWu doesn't feel that the news is worthy of space. Whatever the reason,...there is no way to justify the cruelty of man's inhumanity to man...and the fact that a man's human being under the onstitution of the United States.Wharlest Jackson, of was formerly known to be a 'white man's job'.This 36 year old man, an officer in the local NAACP branch,knew there had been talk among the white workers to the effect that any Negroes promoted to these jobs would not live to enjoy them.This make crimes of this sort Federal crimes.THe 1967 civil rights bill has a section in it which would do just this. -(Taken from a Memorandum from Roy Wilkins-March 8,1967) ...“At present the Federal government is limited to using a conspiracy statute which provides only a fine and a short imprisonment,even for murder. Write to the two Senators from your state. Tell them of the brutal and cowardly murder pf Wharlest Jackson in Natchez, Miss.Ask them to support and vote for the 1967 civil rights bill. 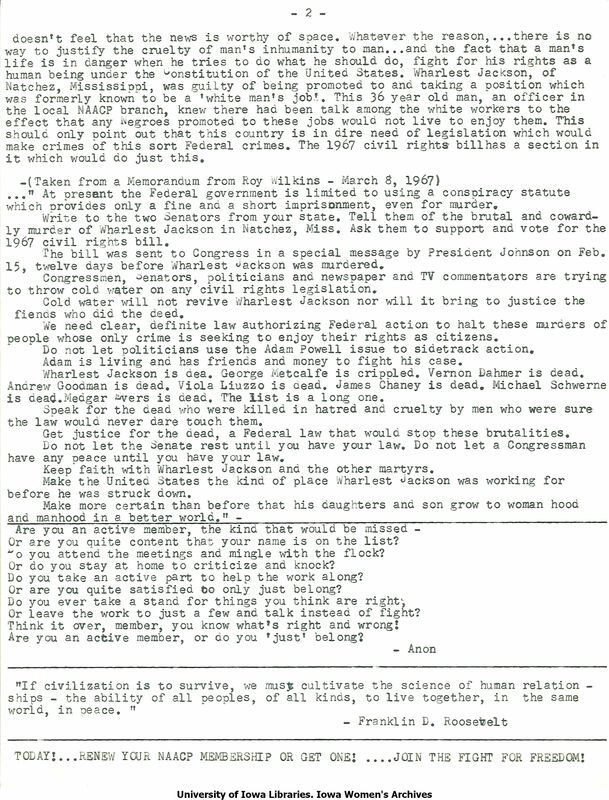 The bill was sent to Congress in a special message by Presicent Johnson on Feb.15,twelve days before Wharlest Jackson was murdered. Congressmen Senators,politicians and newspaper and TV commentators are trying to throw cold water on any civil rights legislaion. Cold water will not revive Wharlest Jackson nor will it bring to justice the freinds who did the dead. We need clear,definite law authorizing Federal action to halt these murders of people whose only crime is seeking to enjoy their rights as citizens. Do not let politicians use the Adam Powell issue to sidetrack action. Adam is living and has friends and money to fight his case. Wharlest Jackson is dea. George Metcalfe is crippled.Vernon Dahmer is dead.Andrew Goodman is dead.Viola Liuzzo is dead.James Chaney is dead.Michael Schwerne is dead.Medgar evers is dead.The list is a long one. Speak for the dead who were killed in hatred and cruelty by men who were sure the law would never dare touch them. Get justice for the dead,a Federal law that would stop these brutalities. Do not let the Senate rest until you have your law.Do not let a Congressman have any peace until you have your law. Keep faith with Wharlest Jackson and the other martyrs. Make the United States the kind of place Wharlest Jackson was working or before he was struck down. Make more certain than before that his daughters and son grow to woman hood and manhood in a better world." Are you an active member,the kind that would be missed. Or are you quite content that your name is on the list? Do you attend the meethings and mingle with the flock? Or do you stay at home to criticize and knock? Do you take an active part to help the work along? Or are you quite satisfied to only just belong? Do you ever take a stand for things you think are right; Or leave the work to just a few and talk instead of fight? Think it over, member, you know what's right and wrong! Are you an active member,or do you 'just' belong? -Anon "If civilization is to survive, we must cultivate the science of human relationships-the ability of all peoples,of all kinds,to live together,inthe same world,in peace." -Franklin D.Roosevelt TODAY!...RENEW YOUR NACCP MEMBERSHIP OR GET ONE!...JOIN THE FIGHT FOR FREEDOM!